Super Bowl commercials ran advertisers about $5-million a pop last year. If you’re reaching for your checkbook now this post probably isn’t for you. We’re going to look at a different marketing strategy today and it’s bound to cost you approximately $5-million less. Do you know the term “gamify?” The word is a 21st-century addition to the English lexicon and refers to the incorporation of game elements to motivate participation. And now back to the Super Bowl. Who’s game for gamifying? 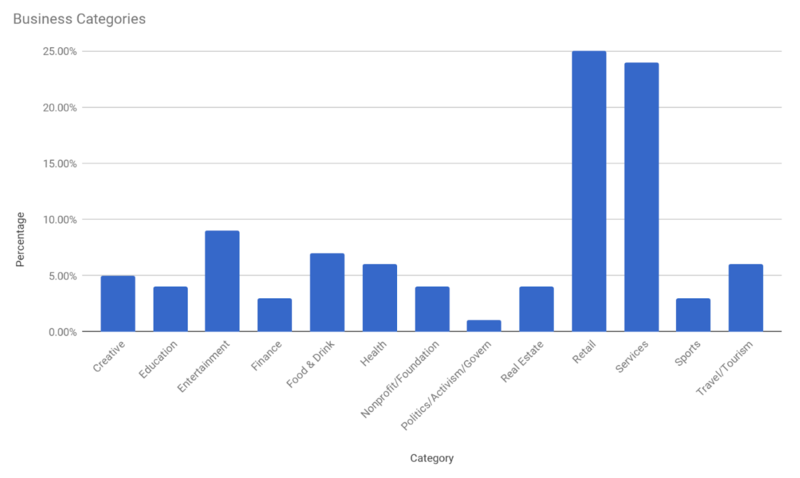 Did you find one of the categories above relevant to your brand? Excellent. Next, I’m going to present a generous sampling of ShortStack templates you can use to create a game, contest, quiz, or something fun leading up to, or following, the big game. I’ll also draw from the some of the industries listed above in an effort to help you brainstorm a relevant Super Bowl marketing strategy for showing your fans a good time on social media. Remember, we’ll be looking at templates here. Perhaps no tactic is more easily attached to the Super Bowl than playing a “Guess the Score” game. As you see in this template, it’s a practical strategy for a sports brand, however, there’s really no reason other types of businesses might not want to call this play. Simply offer a relevant prize. 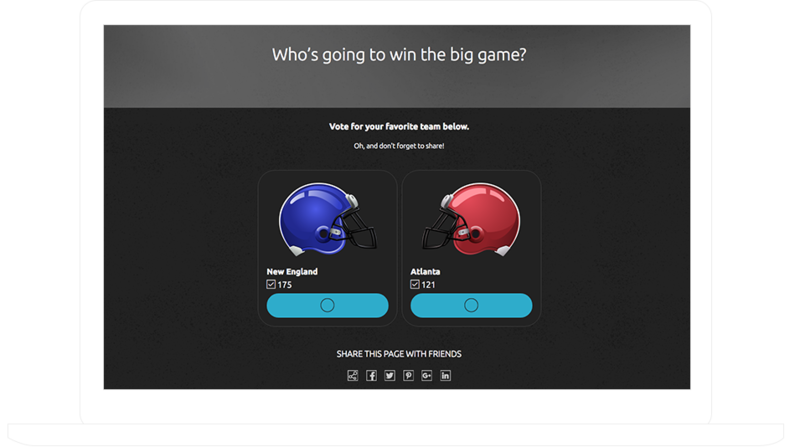 The “polling” template below encourages viewers to cast a vote and share it. You might call for fans to pick a winner early in the post-season when 12 teams enter the playoffs, after the league championships—when the Super Bowl competitors are determined—or any round in-between. A retailer may want to offer team merchandise as a prize. A travel company could offer tickets, flights and accommodations for the game—or any game—or any occasion. Any kind of company could reward participants with donations in their names to NFL charities. No, the items featured below aren’t NFL-branded. They don’t need to be. 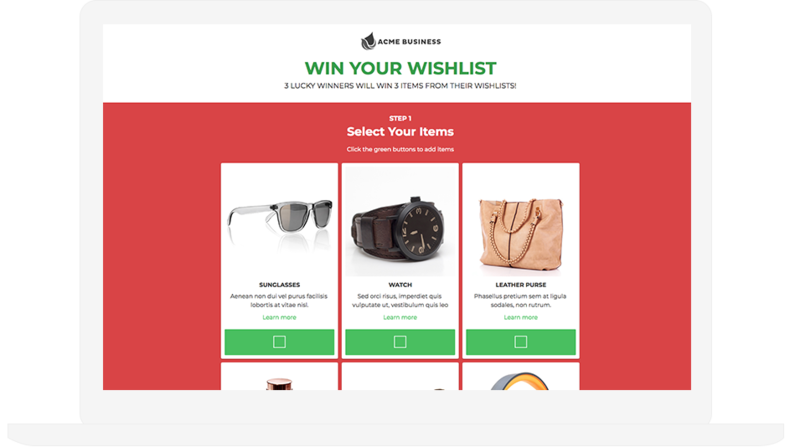 The popular “Win Your Wishlist” game can apply to your business however you choose. Obviously, you could offer NFL merch and goodies, or maybe sporting goods. A food brand might feature foods for enjoying at Super Bowl parties. A restaurant or bar could offer menu items. Instagram and Facebook fever, along with the ubiquity of the smartphone, has made photo contests enormously popular across most age groups. 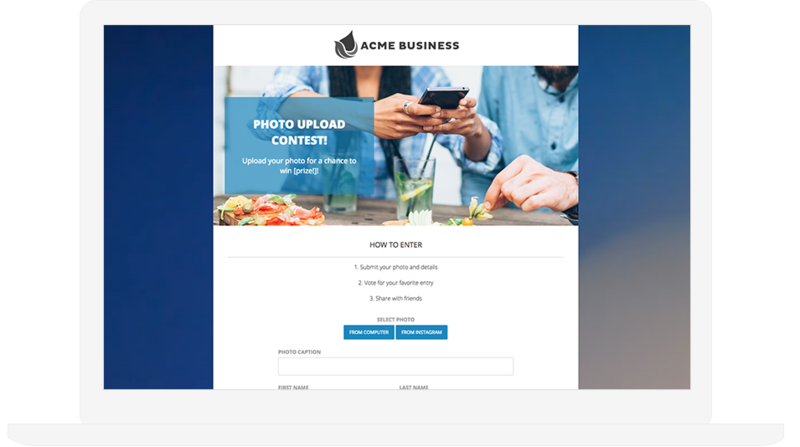 Marketers love photo (and video) contests not just for their magnetism, but also because they result in free and fun content. The user-generated content may live a life of its own on social media or be collected and re-used by the brand (on product pages, in emails, etc.). Share images from a Super Bowl party. Share images of friends and family playing sports. Share party picks, platters and recipes, for food and beverages. 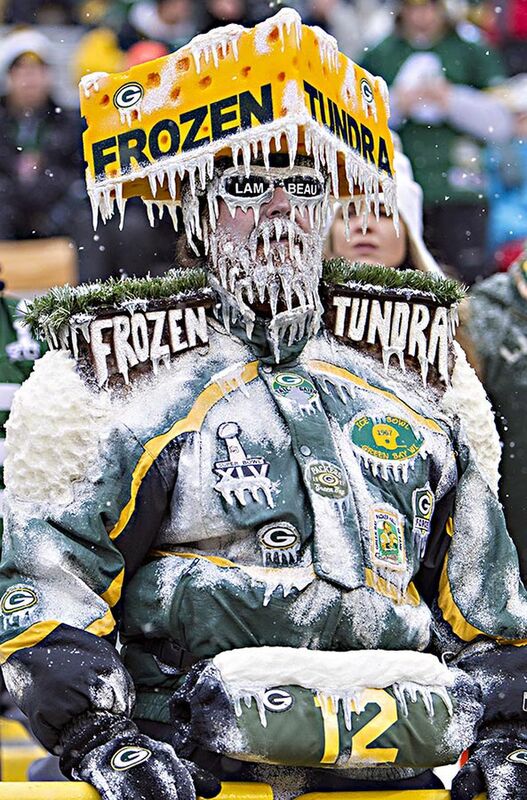 Show you (and the world) what an NFL fan looks like. 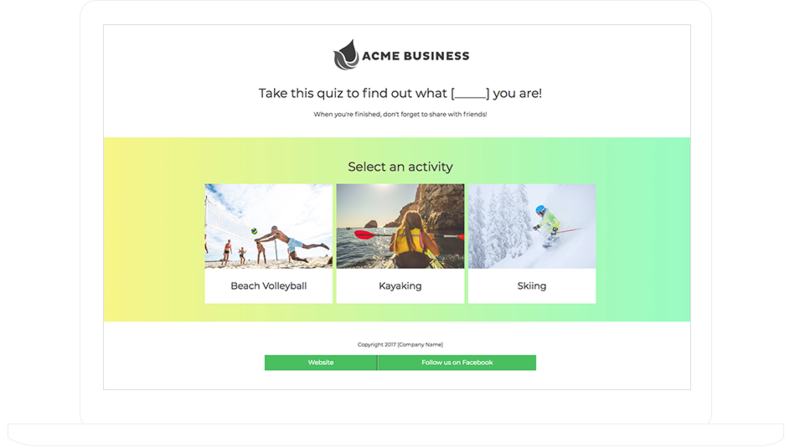 The web has shown us people love to play a quick game of “assess yourself” and get immediate feedback. 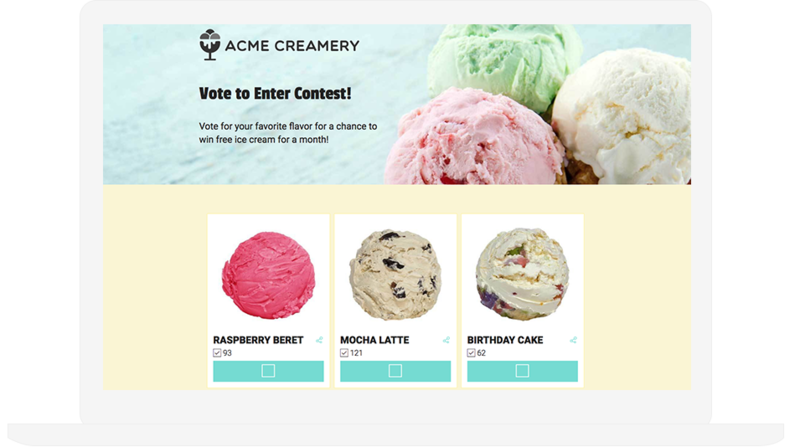 Marketers use ShortStack templates to make all kinds of personality quizzes, assessments and even trivia contests. Caption contests often create a powerful pull for Instagram and Facebook enthusiasts. 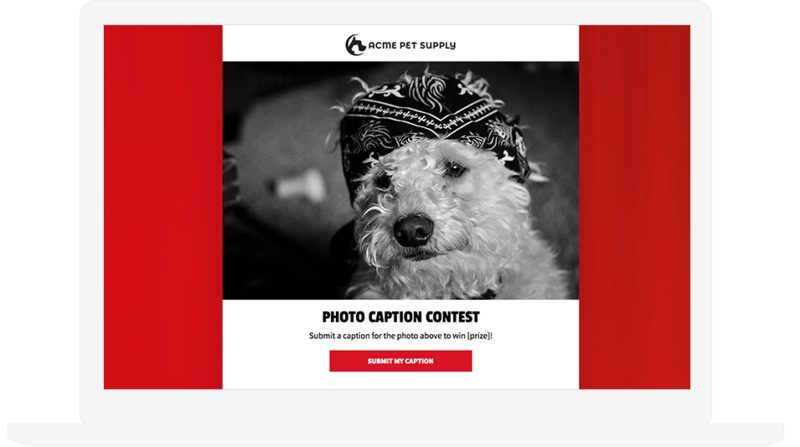 The placeholder image below obviously suggests how a pet brand could conduct a photo caption contest. Perhaps your pooch sports a bandana representing an NFL team. Where else could you take the idea for the Super Bowl? Show a Super Bowl party. And so on. I want to also point out your photo caption contest could include a “vote for your favorite” element. 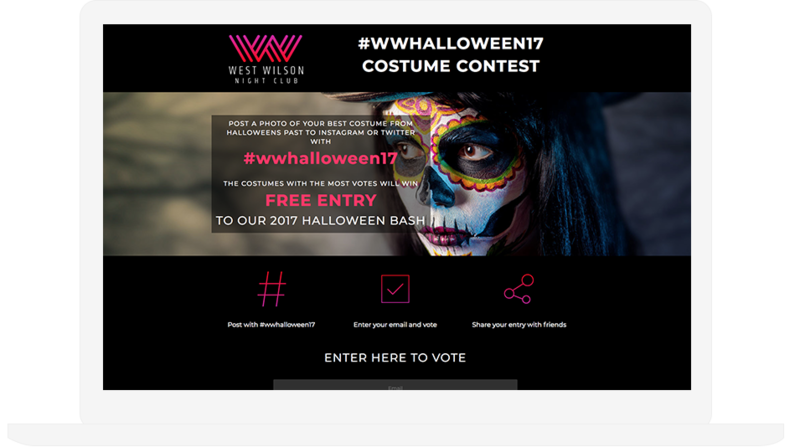 So in addition to engaging participants a first time by writing and submitting a caption, everyone can be invited back to cast a vote. More engagement = more connection with your brand. You can make the world’s easiest game simply by conducting a giveaway. You’ll learn something about your contestant, if that interests you. 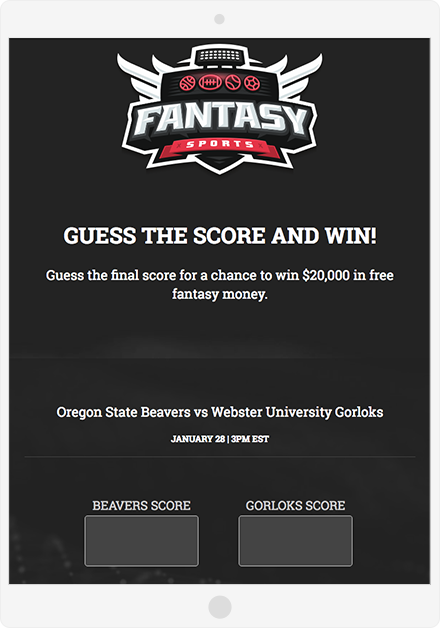 You can publicize the winners. You can offer everyone that enters a prize in the form of a discount, freebie, or content offer. What if you actually do have millions to invest in a Super Bowl commercial? You could—and probably should—add a social media component to complement your TV ad to help rally fans and followers before, during and after the game all across the digital arena. That’s precisely what M&M’s (a Mars Wrigley Confectionery brand) is doing for Super Bowl LII (52). If their TV spot is a touchdown, their dance contest is sure to be a 2-point conversion. Here’s their first Facebook post promoting their “Best Touchdown Dance” contest. Videos need to be tagged with #MMSuperBowlLIIDanceContest and be no longer than 15 seconds. Four winners will receive a Super Bowl party pack, a football-shaped goodie chest filled with M&M’s candy and other branded products valued at $150. I want to show you the entries as well as the results of fan voting, but at the time of writing, the contest has just begun. 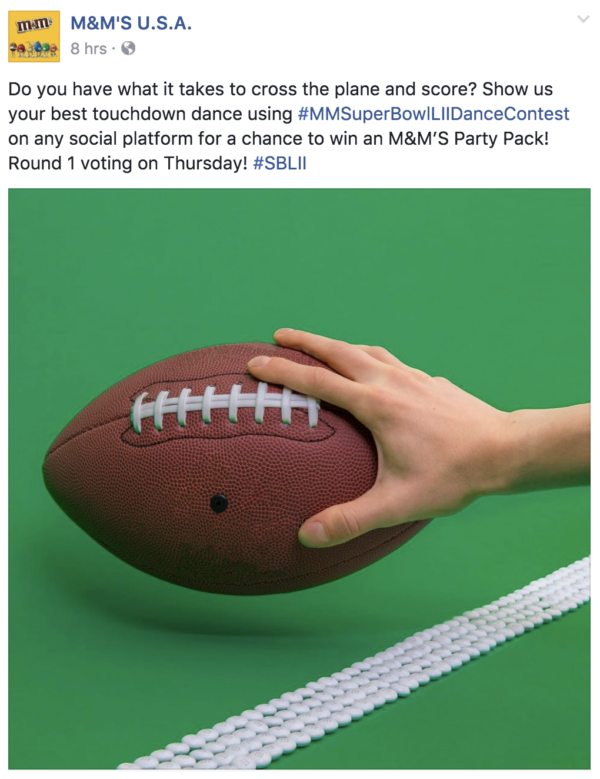 If you’d like to see how contestants have chosen to shake their bodies—with M&M’s packages in hand—search #MMSuperBowlLIIDanceContest. Understand: the Super Bowl, the NFL, or sports at large, brings out the passion in people. Well more than 100 million people watch the Super Bowl. They’re exposed to commercials from 50 or more brands that can somehow afford and justify buying airtime. But almost everybody is touched somehow by the hoopla surrounding the event. It’s fair to say Super Sunday borders on a national (or international) holiday. As you’ve learned, you need not buy commercial time on the broadcast to attach your brand to the amazing fervor the game ignites each winter. If putting a sports spin on your marketing sounds fun to you, it’s bound to sound fun to your prospects and buyers too. You can gamify your marketing for free by creating a ShortStack account and using one of the templates offered. Or you can contact the ShortStack custom services team to schedule a free consultation. They’ll run—or throw—all kinds of ideas at you and help you kickoff an exciting promotion around Super Sunday. Barry Feldman is a content consultant for ShortStack. He is the author of several books and contributes to many of the web’s top marketing sites. Barry was named one of 25 Social Media Marketing Experts You Need to Know by LinkedIn. Read more articles by Barry Feldman.